This past week I had the opportunity to give a devotional on the power of blessing others. I’ve been thinking about blessing ever since. Just this morning in the airport, I was reminded of just how badly people need blessing. Because of the government shut down, hard-working TSA officials are not getting paid. In the rush of travel and the inconvenience of being stopped and searched, people get cranky; as a result, the TSA agents are getting much more cursing than blessing. I took a moment to stop and thank the official personally for how committed she was, even without getting paid. Her face lit up and she smiled. I hadn’t done much. But I was reminded that people are craving a blessing rather than a curse. As humans, we are often evaluating one another. But here’s the thing—blessing is not rooted in grace.The way of Jesus is to bless even those who we might not feel deserve it (Romans 12:14–21). After all, none of us deserve blessing from God. But because of Jesus, God blesses us and calls us His beloved. Imagine! When Jesus intercedes for you, He speaks good things about you to the Father. He is affirming you to the Father. So many of us struggle with feelings of shame and worthlessness, yet God blesses us and calls us His treasured possession (Isaiah 43). The question is: how do we internalize that blessing and pass it on to others so that they too feel treasured? Listen to Father God’s blessing over you.He speaks over you, “This is my beloved child in whom I am well pleased” (Matthew 3:17). Here’s the thing—when God the Father looks at you, He sees Jesus! You look as good to Him as Jesus! Hear that blessing in the spirit of your heart as you read passages such as Luke 3:22, Romans 8:1, Ephesians 3:19-21, and I John 3:1. Meditate on the words and imagine God the Father speaking them over you. Those who realized how blessed they are bless others. Affirm others regularly. Just as God the Father affirms you—calling you holy, dearly loved, precious, and chosen—you can affirm others. Make it your practice to regularly tell others how precious they are and call out their gifts. People are weary of being told what’s wrong with them. Instead, make it your practice to affirm them. Pray blessing over people. Roy Godwin and his wife felt called to run a Christian retreat center in the countryside of Wales. But Roy became desperateto interact with unbelievers, so he prayed and asked God to bring people who didn’t know Jesus to the retreat center. As people came, Roy and his wife began to pray blessing over them. Amazingly, the Spirit of God took over. After being blessed, many fell to their knees in repentance, and many came to faith in Christ. Why? Because when we bless others, the Spirit of God uses our prayers to represent the Father’s heart for people. As you make it your practice to ask people if you can pray blessing over them, I believe you’re going to see the Spirit of God do extraordinary things. As I’ve done this, I’ve never had anyone tell me I can’t pray a prayer of blessing over them. People are hungry for a blessing. Ask God to give you His heart for people and then pray accordingly. If you need some help, use one of these passages of Scripture: Ephesians 3:16-20, Philippians 1:9-11, and Colossians 1:9-12. NFriend, imagine how much happier your home would be if you were blessing your spouse and kids. Imagine how much more peaceful your workplace would be if instead of judging others, you blessed your coworkers. Imagine how your neighborhood and city would change if a blessing movement started. Wouldn’t that be incredible? And here’s what I know – you’ll be blessed as well! 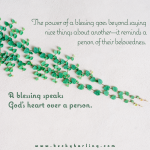 The wise writer of Proverbs wrote, “The one who blesses others is abundantly blessed” (Proverbs 11:25, The Message). Hey – maybe it starts with you! May I gently challenge you to bless three people every day this week? See what happens both in your heart and in the hearts of others. I think you’re going to be astounded! I am in Florida with Steve visiting friends of Reach Beyond. Later this week I will be in Pennsylvania speaking at the Christian Product Expo. Please pray that we will be able to connect well with people and that the Holy Spirit speaks through me to encourage the many bookstore owners at the CPE.